I was seriously unprepared for the whole Jack-o-Lantern carving thing. Nelle had a friend over for a play afterschool, and I had visions of all of us carving pumpkins together - a real group activity. (Good mommy, and all that). The girls drew practice faces on scrap paper - they were so excited - and then set to work drawing with pencils, then markers, on the pumpkins themselves. Easy peasy. The whole face-drawing process took about ... 5 minutes. And then, it was time for carving. And I was on my own. The girls ran off to play with Barbies while I set to work with a paring knife and a heavy steel spoon. They came back periodically to check on my progress, ooh-ing and ah-ing at the masses of seed and flesh that was accumulating in the dish before me. By the end of one pumpkin, I'd felt like Jillian Michaels had just attacked my arm with her fists (like I swear she does in this workout ) ... and I still had a second pumpkin to go. The only thing that got me through was the realisation that I was a) sending home pumpkin #2 unfinished (sorry Wendy!) and b) there was NO WAY IN HELL I was throwing out the scooped-out pumpkin innards. I WAS GOING TO USE THEM ALL. So what do you do with Halloween pumpkin carvings? 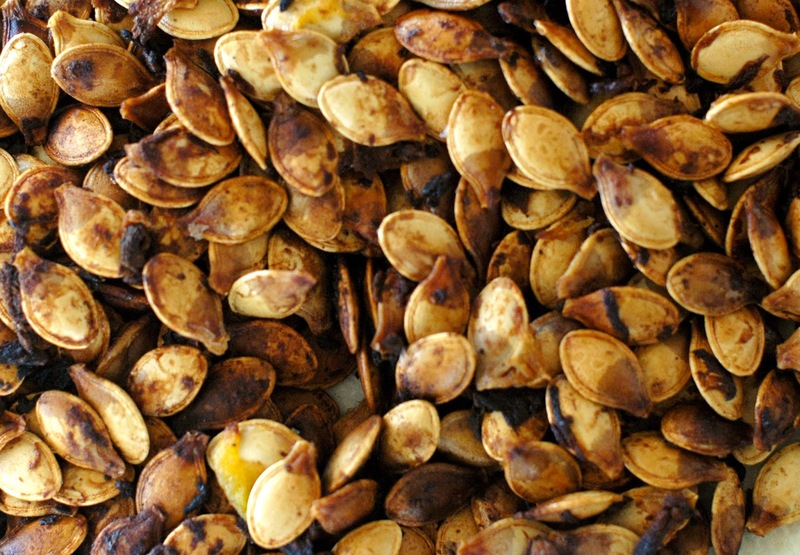 I roasted (and devoured) the seeds. I made a pumpkin and shittake stew, which then became lasagne. 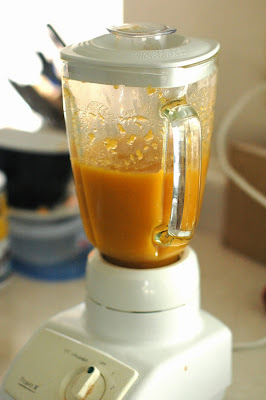 I made pumpkin puree, which found its way into muffins (and, temporarily, my fridge). NOTE: If you aren't actually Jack-o-Lanterning your pumpkin, you could cut and roast it like you would a butternut squash .. but if you're drawing on it, and filling it with waxy candles, and leaving it out of the fridge and on your porch for extended periods, it's better not to eat the shell part. Stick with cooking up the insides as you carve them out. 3. 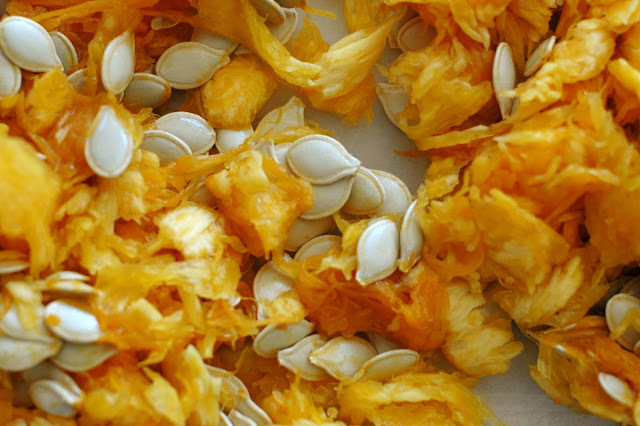 Toss each cup of pumpkin seeds, in 1 Tbs extra virgin olive oil (or coconut oil) and 1/4 -1/2 tsp sea salt (depending on how salty you like them). 4. 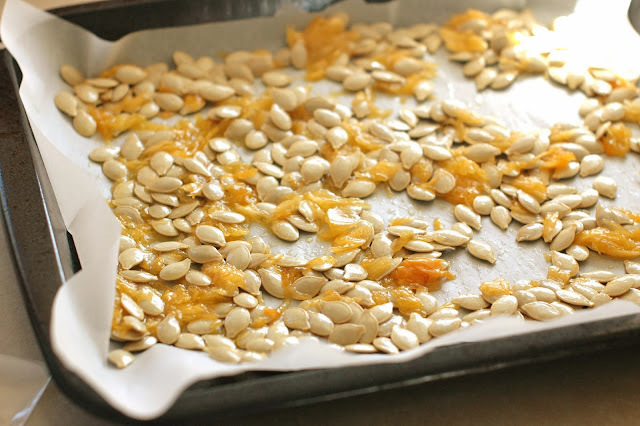 Spread the seeds across a parchment-covered baking sheet so they (ideally) aren't touching each other too much. 5. Roast for 20-25 minutes, stirring them up after 10 min. And again 10 min later. And then (if needed) put the seeds back in the oven for up to 5 min more. When done, they should be golden and dry. Remove from the tray and put into a dish lined with paper towel to absorb excess oil (or else they'll reabsorb it and become soggy). And dig in. These things are super-amazing good for you. 1. In a heavy stew pot, soften the onion in 1 Tbs butter over medium heat. When translucent, add the mushrooms and the 2nd Tbs butter. 2. When the mushrooms are cooked, add the pumpkin with a nice dash of salt and pepper. Saute till soft, breaking up clumps of pumpkin as it cooks. 3. Serve as a side dish, or with rice for a main. 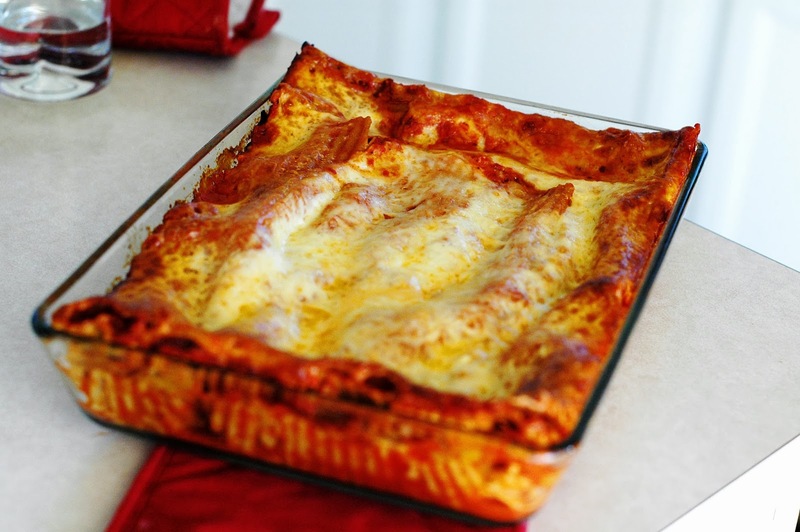 Extras are perfect in the lasagne below! *If you use cottage cheese instead, add an egg to it. 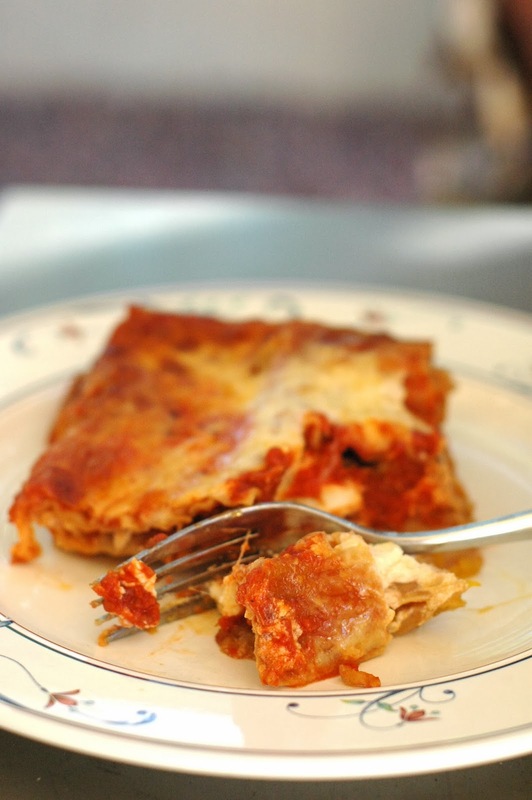 Cottage cheese has a higher water content that can make your lasagne soupy. 1. Preheat the oven to 180C (360F). 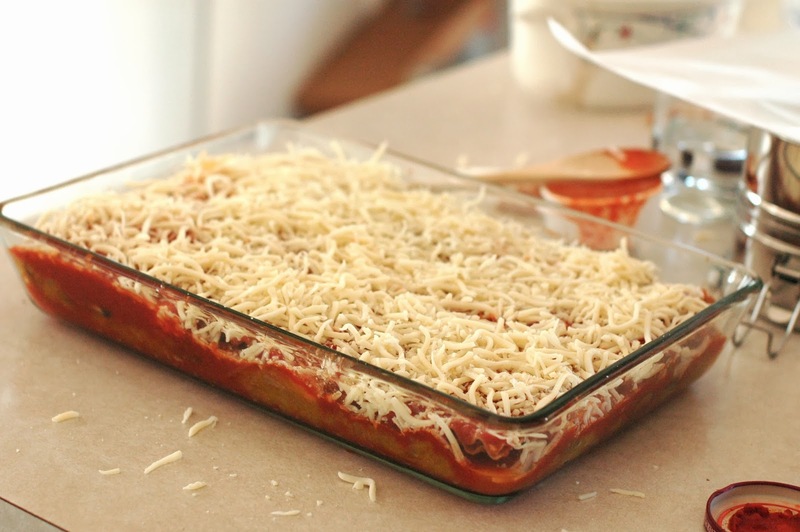 NOTE: When making lasagne, make sure the dry noodles are completely covered with a thick liquid of some sort (too thin, and it'll be runny) and insulate with foil for the main part of cooking. 3. Cover with foil and bake at 360 for 45 min. Then uncover and cook an additional 15 min. Set aside 10-15 min before serving. This lasagne is so easy, and I can't get enough of it! Tomorrow I'm seriously topping a slice with fried egg for breakfast. 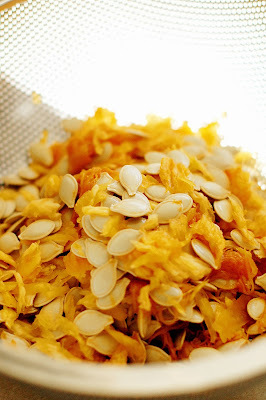 For every cup of pumpkin flesh, add 1/3 cup water and simmer over low heat until soft (about 20 min). Set aside, and when cool - blend. 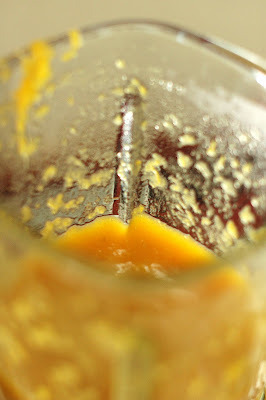 Freeze puree in ice cube trays and store in airtight containers in the freezer until you need them. 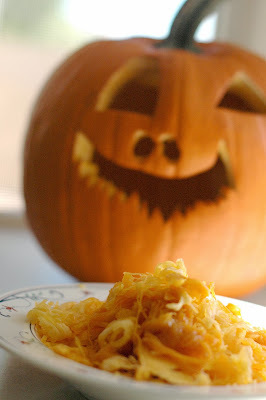 Want more Halloween-y recipes? Check all these great Food Network #FallFest blogs out for inspiration! These recipes look amazing. We're thankful for the pumpkin that you cleaned out for Aubrey. Her father carved a cat into it and it sat proudly at the pumpkin walk. It is now sitting on our porch. 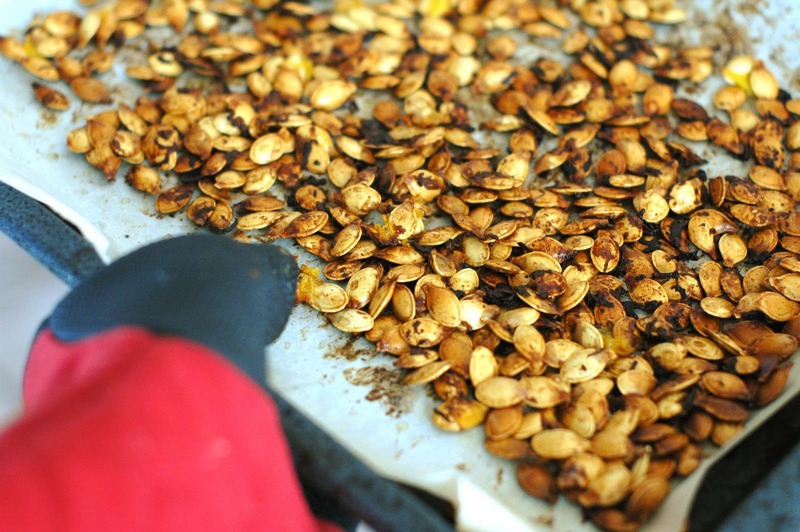 i love roasting the pumpkin seeds! i am going to try this. but first i'm going to pin it! @Amanda F Hi Amanda - homemade pumpkin puree will be more watery than canned, (also better for you and fresher-tasting :) ) especially as we added some water in cooking. 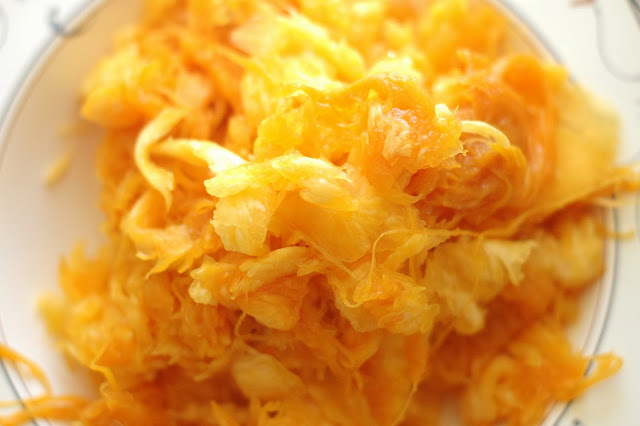 But wateriness is easy to fix - just strain your puree through cheesecloth until it reaches the thickness you like. Then it should work just like the canned stuff! So industrious, you really used up the whole pumpkin! And on top of that, everything looks freaking delicious! Cutest little fairy ever! Your time and efforts carving the pumpkins were not wasted, that's for sure. 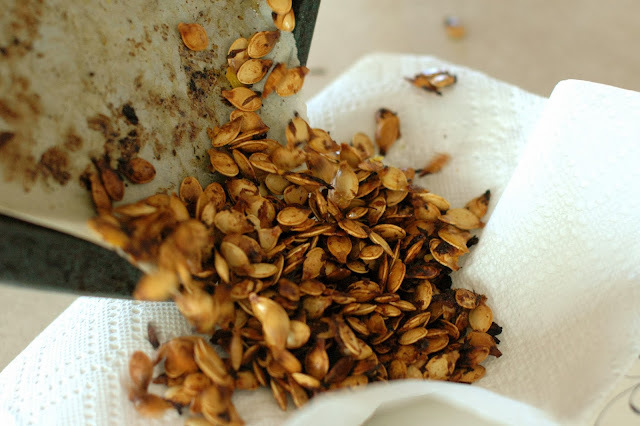 All your recipes/dishes look wonderful and the roasted seeds are a great treat. Love your carved pumpkin by the way...very detailed mouth.